4 - Lori Campbell 2 — Our Ink, Our Stories. Lori Campbell’s first-ever tattoo packs a lot of meaning into one image. 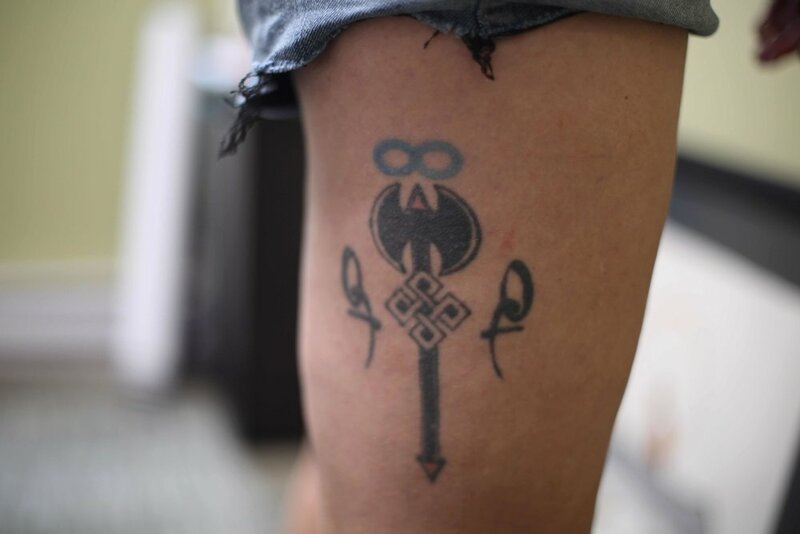 On her right thigh there is a labrys (a double headed axe) with a Celtic knot in the handle. Pink triangles adorn the top and bottom points, and a blue infinity symbol sits above the whole design. In the late 90s, her life was in an interesting place. She had yet to meet her birth family – Campbell is Cree Metis and was part of the Sixties Scoop – and she was starting her journey to becoming more connected with her Indigenous heritage. Alongside that, she was a firmly out and proud lesbian who had just left the Canadian army. All of those experiences led to the labrys tattoo, done at Rising Sun in Regina. “I really feel that the only way I am able to be who I am today and to do the work that I do and to walk the way I do in this world, I had to go through everything I went through in order to get to this point . . . all those stories come with me,” Campbell said. Strong Indigenous female characters abound in the novels of Anishinaabe author Louise Erdrich. Follow the generations-long tale of love overcoming colonial violence in her recent book, LaRose.